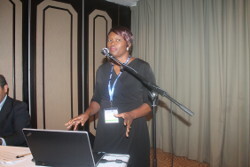 Lydia Chabala, an soil scientist from Zambia can still not predict the amount of time and money it would have taken and cost her to complete her PhD research if she had not been introduced to the Zambia Research and Education Network (ZAMREN)’s high speed internet connectivity. Chabala’s research focused on soil-environmental modeling for digital soil mapping in the Chongwe-Rufunsa area of Zambia. The researcher says it was not easy to download and analyse the sets using data bundles she bought from commercial internet service providers as this was not only expensive but also time consuming. “Because I was facing so many roadblocks on how to acquire data for my research, I started looking around for high speed internet connectivity as it was becoming expensive for me to continue buying data bundles. Eventually I met the CEO of ZAMREN Mr. Bonny Khunga who introduced me to the ZAMREN network and thanks to this network, I was able to download many images and and run my model in a short time.” says Chabala. Having benefitted from the research and education network Chabala now wants more researchers in Zambia to be introduced to this network for them to experience similar ease of doing research.